Updated Saturday June 30, 2018 by Nashua Cal Ripken. 6 games in 7 days. Nashua was down 13-1 in the bottom of the 4th and were 3 outs away from being hit with the 10 run rule but they roared back and scored 17 runs, highlighted by Harrison Joshi’s 3 run double. Joshi went 3 for 4. Ryan Caruso and Jack Ninteau chipped in with 2 hits apiece. Max Demers and Cooper Vaillancourt made a couple nice plays in the final inning defensively. Braydon Ouellet pitched the final 2 and a third for the win. Nashua plays Keene tomorrow, a win would earn them a trip to states. Nashua started out strong but couldn’t stop the Keene bats. Harrison Joshi, Brooke Berger, and Brady Wessel had the lone hits for Nashua. Nolan Sullivan and Max Demers pitched and kept Keene close until an eight run 4th inning ended the game in a walk-off. Nashua scored 14 runs behind the hitting of Jack Ninteau, Max Demers, and Nolan Sullivan. Nashua got up early with 5 runs in the 1st. Brooke Berger, Brady Wessel and Brayden Ouellet held Merrimack to one run. With this win, Nashua qualified for States in Walpole. Ryan Caruso stole home for a walk off 10-9 win over Hollis/Brookline in Swanzey. It was a back and forth battle. Max Demers had a big triple and Will McKenney had a key 2-run bunt to spark the offense for Nashua. Brooke Berger pitched four outstanding innings to keep the game close and Brayden Ouellet closed the game for the win. In a second straight one run game, Nashua beats Keene to get to the 9U Championship against Swanzey. Brady Wessel started for Nashua and pitched 3 strong, Max Demers came in and pitched the last 3 for the victory. Jack Ninteau had a key triple in the 5th. Max Demers went 3 for 4 and Brooke Berger had a double. Will McKenney and Harrison Joshi added some nice defensive plays. 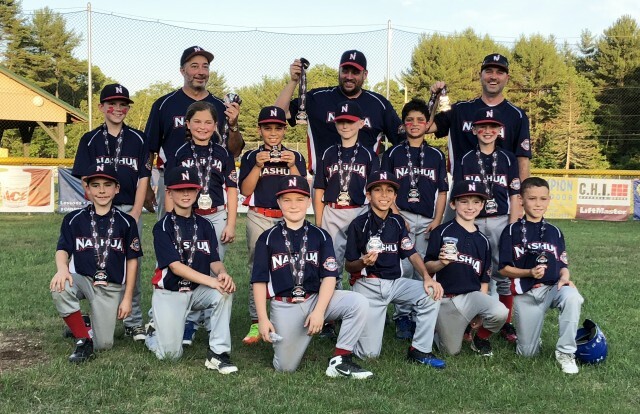 Nashua fell to Swanzey in the 9U West Area tournament 15-6. Nashua started out strong scoring 3 in the top of the first. Brooke Berger doubled in two. Swanzey got 9 unanswered runs and led 9-3 until the 4th when Nashua battled back with 3. Base hits by Cam Flanders, Brayden Ouellet, Cooper Vaillancourt, and Brady Wessel helped start the rally. Andrew Thibeault added a double. Swanzey put the game away in the bottom of the 5th with 6 runs. Nashua is the runner up and will be moving to States.